"She's going to be like a big sister to her." 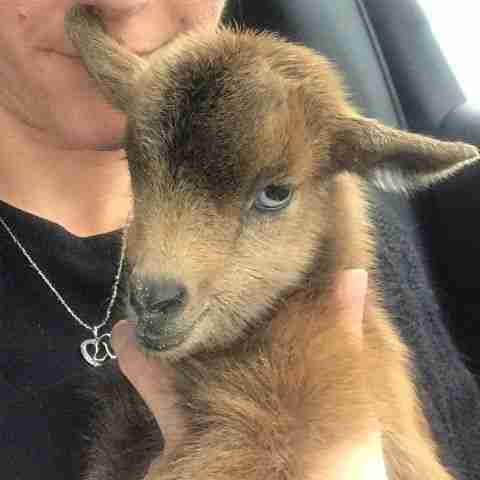 Pippa is one of the most expressive goats Leanne Lauricella has ever seen. "She has a very animated face," Lauricella told The Dodo. "She often has this shocked look. But she's not scared. Actually, her personality is extremely laid-back." 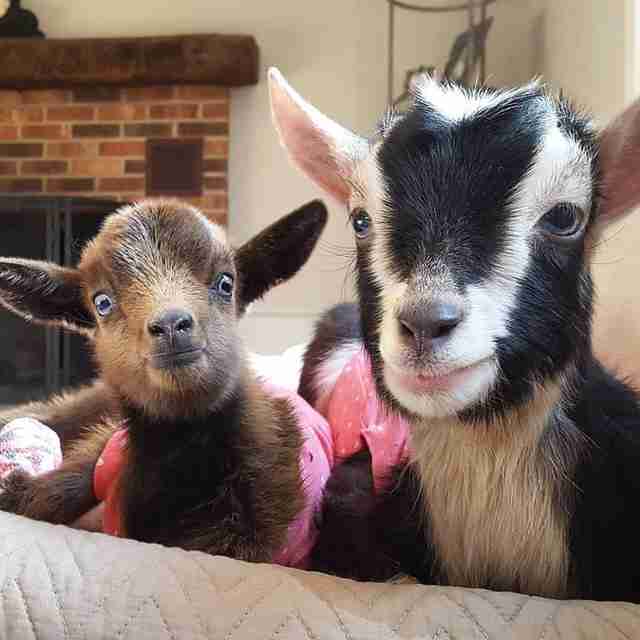 Lauricella runs Goats of Anarchy, a rescue group for goats with special needs, in New Jersey. Pippa is her latest baby, just 7 days old and only 2 pounds. "A couple contacted me the day after she was born, so she was a day old," Lauricella said. "They were saying that two of her hooves were cracked and falling off." While it's not clear exactly what happened to Pippa, the couple, from Missouri, told Lauricella they found her lying outside with her front right leg and back left leg sticking out, both injured. 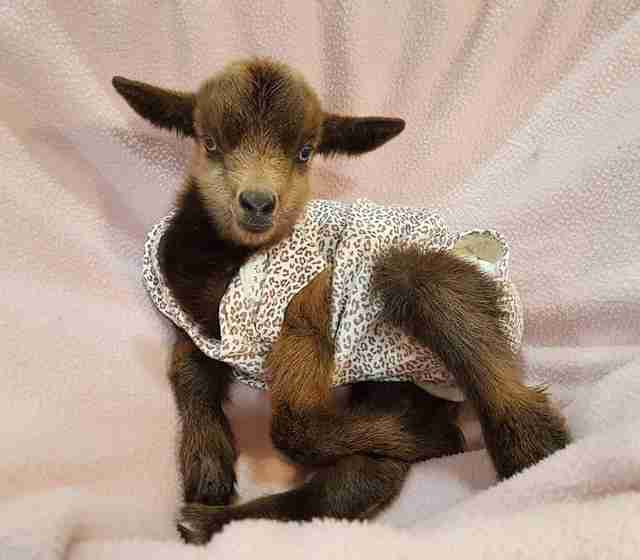 "Goats normally curl all their legs under, and that's how they keep them warm" Lauricella explained. "The couple said that for some reason, Pippa was lying with both of those legs out." 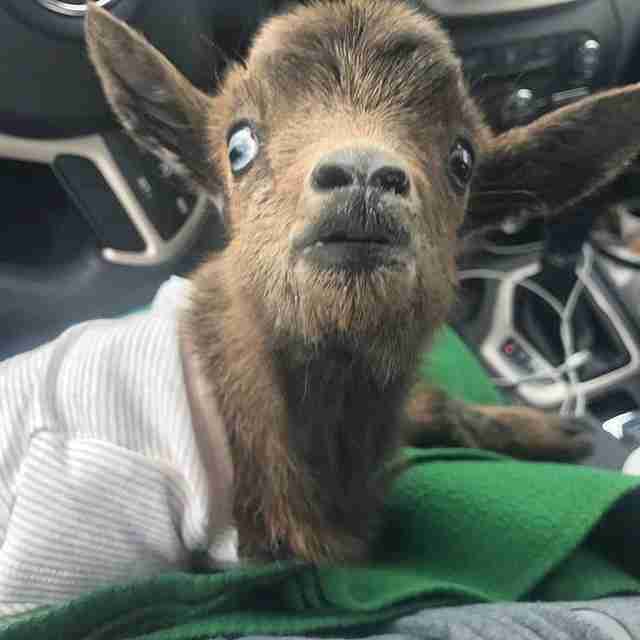 So, Lauricella sent a volunteer to Missouri to pick up the injured goat. After a two-day car trip, Pippa arrived at her new home in New Jersey. From there, Lauricella took Pippa straight to a vet, and then another for a second opinion. "They said, 'We have no idea,'" Lauricella said. "It could be frostbite. 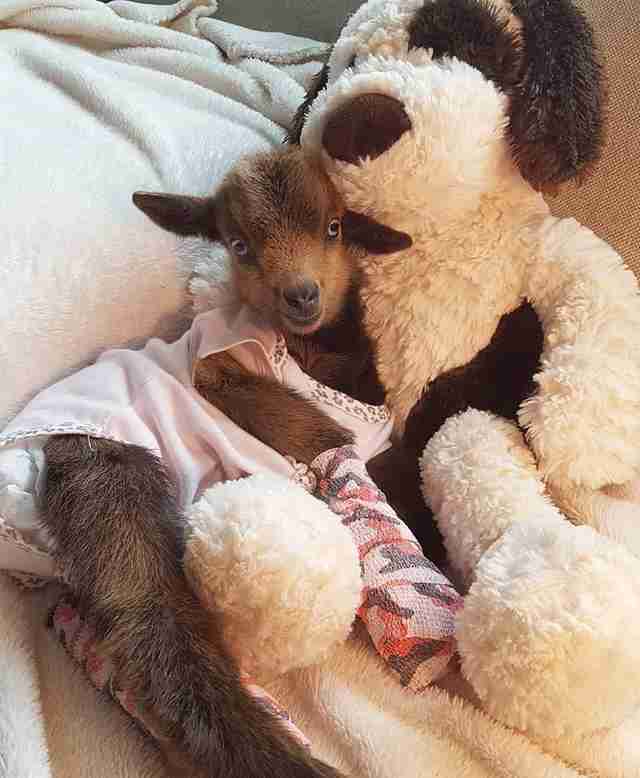 Or it could be a crush injury because the goat's foot was mangled a little bit. They thought maybe her mom had stepped on her feet, or [she] got stampeded somehow." 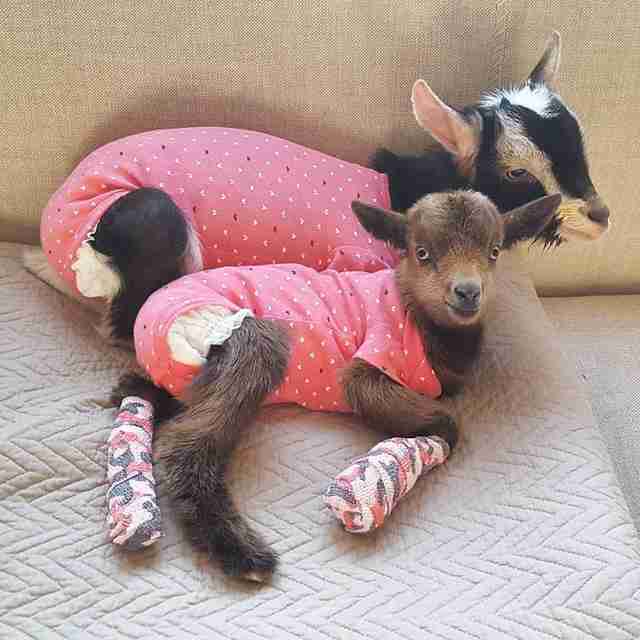 Upon the vet's advice, Lauricella kept Pippa's legs wrapped in bandages. But the next day, Lauricella got the shock of her life. When Lauricella changed Pippa's bandages, she discovered that Pippa's feet were shriveled up and had turned black. "I sent the pictures to both of the vets, and they said, 'Yup, that's frostbite,'" Lauricella said. Pippa is still too young to have her legs amputated, so the vets advised Lauricella to keep Pippa's legs bandaged, and to change the bandages every day. If all goes well, the injured sections of Pippa's legs will naturally fall off. To speed up the healing process, Pippa is on antibiotics, and Lauricella treats her wounds with medical-grade manuka honey. 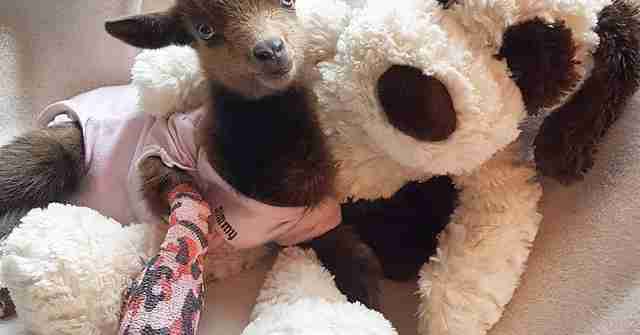 Pippa can't walk at the moment, but as soon as Pippa's feeling a little better, Lauricella plans to create temporary prosthetics with foam pipe insulators, like she did for another rescue goat, Pocket, who was born without back legs. "Pocket's running around like a crazy man right now," Lauricella said. "He's just nuts. So as soon as [Pippa] heals, we're going to do the same thing with her, just so she can get used to walking and using the muscle." Eventually Pippa will get real prosthetics. 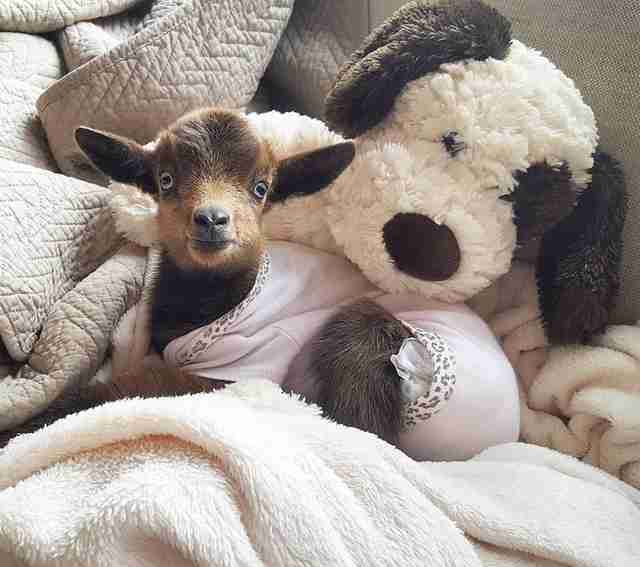 Pippa currently lives inside Lauricella's house with Pocket and another rescue goat named Polly. 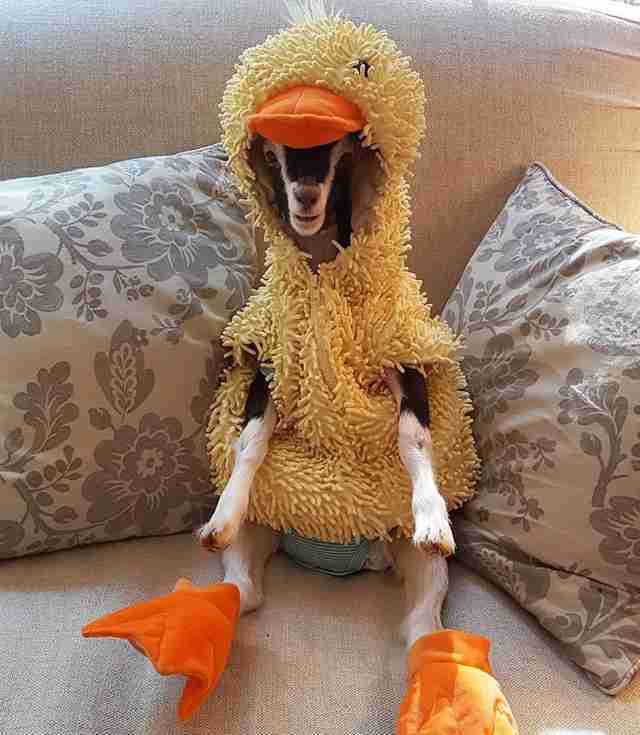 Like Pippa, Pocket and Polly have special needs - Pocket doesn't have back legs, and Polly has neurological problems and anxiety - for comfort, Polly wears a special duck costume. Pippa adores them both. "She's very sweet, very lovable and loves to snuggle," Lauricella said. "She really loves Polly and Pocket." But it's Polly who has taken a particular liking to Pippa. "Polly's being really nice and sweet to her," Lauricella said. "She's going to be like a big sister to her." Pippa may have had a rough start to life, but Lauricella expects her to make a full recovery, and to live a long and happy life at the sanctuary. "Pippa's doing really well," Lauricella said. "It will take some healing and some rehab, but I think she'll be OK. She's just going to be another baby that we have on prosthetics." 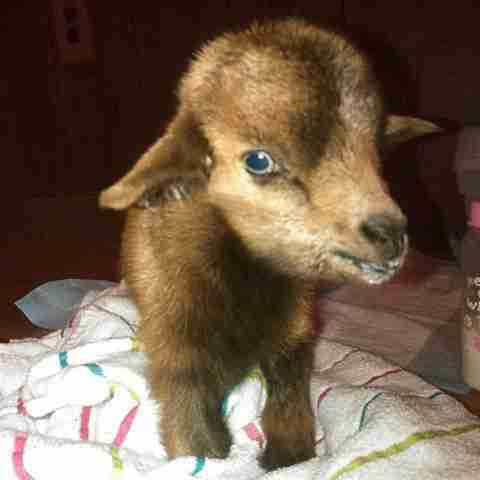 To help special needs goats like Pippa, Polly and Pocket, you can make a donation to Goats of Anarchy here.